Not much of a news roundup this week. 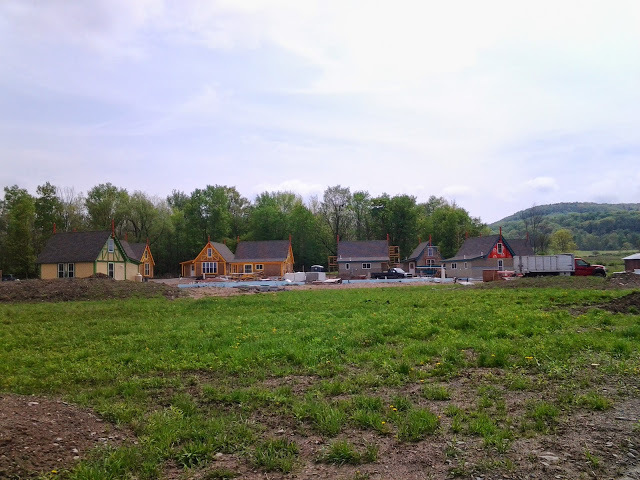 Nothing new to report from the city except that the Texas Roadhouse was approved, and the only item on the town of Ithaca’s planning board agenda for next week will be the review of a subdivision to create a new home lot off of Hanshaw Road. With the lack of news acknowledged, there were at least a few things I wrote up for the Ithaca Voice this past week that will happily fulfill your reading time if you haven’t glanced over them already. 1. Maplewood Park Closure, Replacement Likely – To loyal reader “CS PhD”, I honestly had no idea what you were referring to in your comment on the Boiceville post until a Cornell press release reached by inbox a couple hours later. I did reach out to Ithaca East (old Maple Hill) manager Bruce Abbott, who told me that Cornell has a two-year notice in case of closure, which gets renewed by June 30th. In practice, that means that the 81-unit Ithaca East apartment complex won’t close until June 30th 2017 at the earliest, but Cornell has until the end of next month to decide whether or not to extend that to at least 2018. 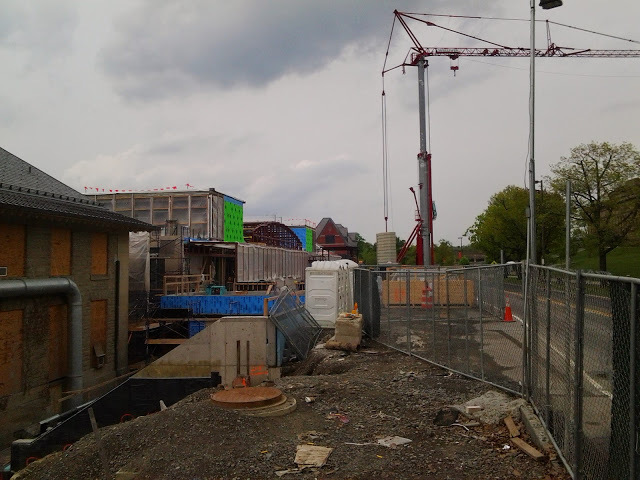 As Abbott mentioned in his email, “Currently, I have 70% Cornell graduate students [in the tenant mix], so I may be considered a resource to them [Cornell] while they are replacing Maplewood. Otherwise, I have about 35 days before I know what the future holds.” And we shall see what happens; Ithaca East with its couple hundred bedrooms likely won’t be closed until that much replacement housing has been built and opened at the Maplewood Park site. 480 bedrooms will be tough enough for the market to absorb as it is. Edit: In a follow-up email, Bruce Abbott corrected the dates – Cornell has to notify him by June 1st and a theoretical closing would be May 30th, 2017 at the earliest. 2. National chain Smashburger plans to open Ithaca franchise – Although no locations were given, a casual check suggests that it’ll be in a suburban location in an already-built space, although urban spots aren’t completely out of the question. A typical Smashburger is a little over 2,000 sq ft, and they don’t have drive-thrus. For example, the one in suburban Albany reuses what was once a Friendly’s. Smashburger locations typically employ about 25, and franchising requires a net worth of $1.5 million, including $500k in liquid assets. No surprise, the Voice readers have been spirited in their assessment…it definitely didn’t help Fine Line Bistro’s closing was published this morning. The reaction isn’t quite as controversial as Texas Roadhouse, probably because not as many people are familiar with Smashburger. I look both forward and dread the day I write about Sonic (which is looking to come into the market), Trader Joe’s (of which I’ve heard nothing), or any other very high profile chain makes their move into the area. 3. 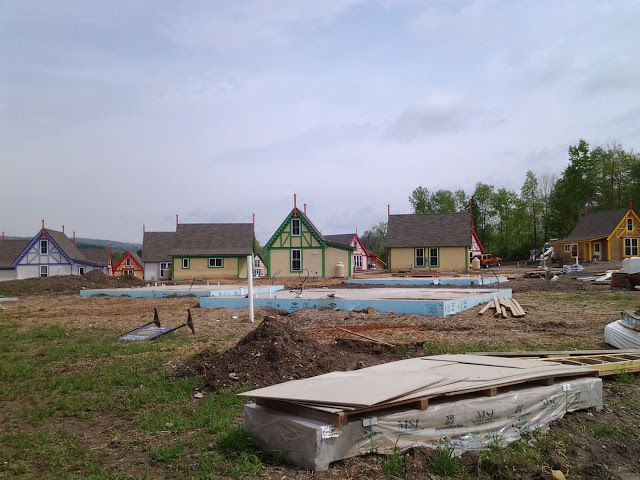 Which Tompkins County towns are growing fastest? – Most towns reported growth year-over-year, and the census revised the 2013 numbers upward. Ithaca city now stands at an estimated 30,720, an increase of 706 since the 2010 census. 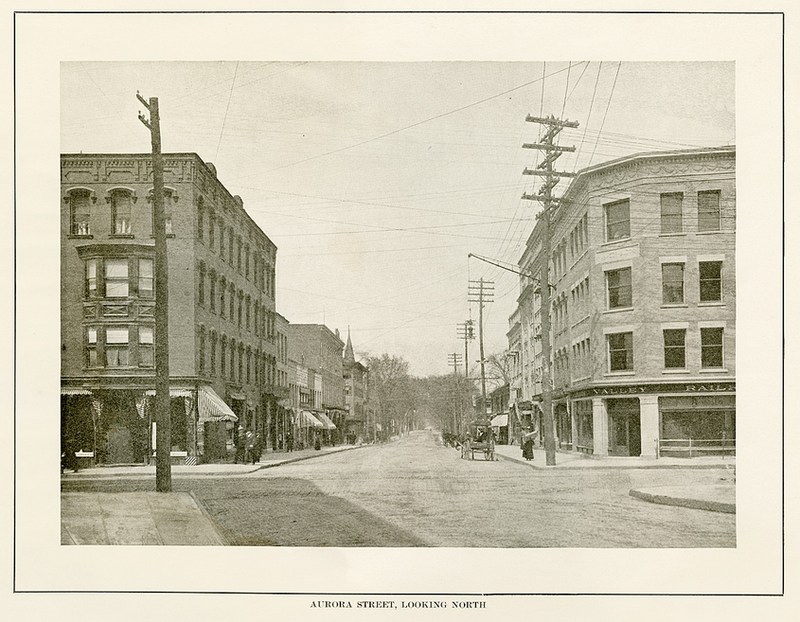 Ithaca town, for which the Census Bureau includes Cayuga Heights, stands at 20,515, an increase of 585. Now comes my gut check – I think the city numbers and town numbers a little high. I base that off of building permits. 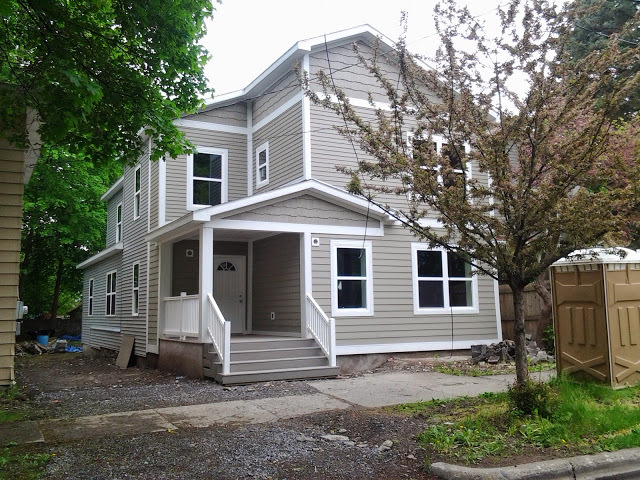 If I count the number of annual permits given in the federal HUD SOCDS database, I get 127 units (75 single-family homes and 52 multi-unit) for 2010-2014, and just 14 units, 10 single-family homes and two duplexes, in all of 2014. If one assumes 3-bedroom house and 2-bedroom apartments for statistics’ sake, then one gets 329 residents. 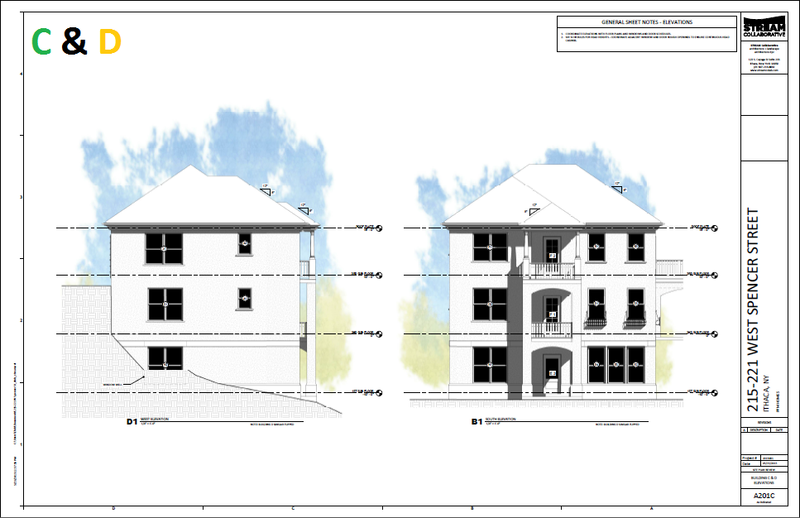 Cayuga Heights add 27 units – 24 1-bedrooms in the current Kendal expansion, one two-unit (most likely the rear addition to 207 Kelvin Place), and one new home since 2010. I think that equates to about 33. So 362 total, only ~62% of 585. As for the city, there were 259 new units, of which only 12 were single-family homes. Using the same math as before gives 530 residents in new units, 75% of total. I’m not sure how things like renovations or reuse projects are handled, so the city might be within the margin of error on my back-of-the-envelope calculation. But for the town, probably not. Long story short, take the population estimates with a healthy dose of skepticism. Part I looked at how in the past 25 years, Ithaca and Tompkins County had their keisters handed to them by a deep 1990s recession, but came out of the Great Recession of the late 2000s nearly unscathed. Part II provided a break down of job growth by BLS sectors – some sectors, like manufacturing and trade, have given way over the years to a workforce increasingly made up of engineers, scientists and social activists. However, two big attractions have yet to be discussed – “Government” and “Education and Healthcare”. Those will be covered here in Part III. At left is the plot of jobs from 1990 to 2015 in the “Government” sector. Cue the sharpening of the pitchforks. Yes, the token government bureaucrat falls in this category. So do police officers, firefighters and military personnel. The sector shrank briefly in the early 1990s and has grown or held steady since. But in the 2000s recession, there’s an enormous boost – from November 2008’s 9,000 jobs to January 2010’s 10,300. The sector maxed at 10,400 jobs, over 15% of the local market, in October and November 2011. The annual average number of government jobs that year was 10,000, and it has fallen steadily since, with last year’s annual average total of government jobs being about 9,100. Now the proverbial juggernaut, “Education and Health Services”. Cornell, Ithaca College, TC3, ICSD and other local school districts, as well as doctors, nurses and so forth. Just how much of the local economy does this sector comprise? I plotted it out in annual average proportions below. Since 1990, it’s climbed from about 45% of the total job market to 55% of the total job market. The colleges and university by themselves account for nearly 10,000 jobs. In the BLS plot, the sector shrinks a little in the early 1990s, but then it’s climbed ever since, though with a strong amount of seasonality as a result of the academic year. Now back to the recession question. If Cornell cut hundreds of jobs, and IC didn’t really grow (according to their own reports), what helped cosset Ithaca from the economic maelstrom a few years ago? Why did it do so much better in the 2000s than the 1990s? The other half of that economic sector. Healthcare. It’s no big secret that healthcare has been a big grower in the county for the past several years. The local healthcare industry was essentially untouched by the 2000s recession. Cayuga Medical Center has added over 500 jobs since 2008. Baby Boomers are retiring in large numbers, and they expect a full suite of healthcare services; and while the Boomers are generally fleeing this state by the truckload for warm, low-tax locales like Florida, college towns with a high quality of life, such as Ithaca, are seen as a major draw in their own regard. As more boomers look to a community like Ithaca as an alternative to the golf course-and-shuffleboard crowd, it creates more healthcare job opportunities, which are spearheading job growth in the region. So there’s the hypothetical conclusion – growth in several small sectors and government helped to offset losses in other sectors during the late 2000s recession, but the real difference between the early 1990s and late 2000s is the growing healthcare market created in large part by an older, retiring population. Health services buoyed the local economy even when Cornell and IC were financially stressed. These days, they all work together to bring job growth to Ithaca and set new record highs in local employment. Now comes the gut check – does that conclusion make sense? The question was posed to local economists and economic development officials. Unfortunately, there was no real consensus because the conclusion was unable to be thoroughly proven. A slight disappointment, but for what it’s worth, there is no doubt that Ithaca’s economy handled the latest recession well. Tompkins County is a rare economic bright spot in an otherwise depressed upstate economy. Part I provided a brief examination of how the 1990s recession had a deep and lasting impact on the Ithaca economy, while the late 2000s recession was a minor hiccup in comparison. Here in Part II, those recessions will be looked at in greater detail by examining the different occupational groups that make up the Ithaca economy. To see how the overall market changed, here is the plot of all the non-farm job sectors calculated, combined and tracked by the Federal Bureau of Labor Statistics (BLS) from 1990 to 2015. 1990 gives a nice 25-year figure, and it’s also as far as the online data goes back. There are ten economic sectors defined by the BLS, and all counts are rounded to the nearest 100. Not all of them follow the same pattern as the overall numbers, as seen in the four sectors below. Even with the substantial growth in the Ithaca economy, not all parts of the local economy reflect that. At top left is “Mining, Logging and Construction,” which in Ithaca is mostly construction and the Cargill salt mines in Lansing. Employment peaked at 1,700 in August 1990, fell during the economic doldrums of the 1990s, and has made a very gentle climb since the late 1990s, most likely due to population growth and the slow if steady rise in construction demand. Cornell’s recent budget problems could derail that rise. At top right, “Manufacturing”, industrial makers and producers. Manufacturing peaked at 4,600 in October and November 2000. The woes in this sector match much of upstate – manufacturers closed or left the area for cheaper sites down south or overseas, like Ithaca Gun in 1986/87, NCR/Axiohm in the 1990s and Morse Chain in the late 2000s (Morse Chain shed 500 jobs in the late 2000s, which explains some of the plunge). Fortunately, companies like Borg Warner still maintain a strong presence, and there has been some growth lately thanks to firms such as Groton’s Plastisol and Ithaca’s Incodema. Lower left is “Trade, Transportation and Utilities”. In this category is where truckers, warehouse workers, retailers, wholesalers and utility crews fall. This category peaked at 7,000 jobs twice, in January 2006 and January 2008, but has fallen closer to 6,000 jobs in the past year or so. The early 1990s dip is there, as is a dip during the late 2000s recession. 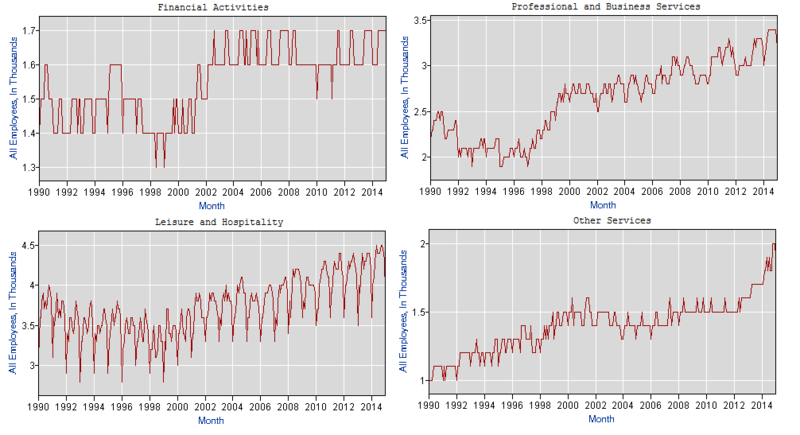 Overall, the sector’s employment hasn’t changed a whole lot in the past 25 years. Last image in the figure, at the lower right, is “Information“. Publishers, broadcasters, news agencies like the Ithaca Voice, telecommunications, movie makers, and so on. The category has never employed more than 800 people locally, and is at an all time low as of late (on a national level, the industry has shrunk by a third since the early 2000s). It doesn’t follow the recessions, but it’s a tiny portion of the Ithaca market anyway. The big difference between the first four and these four is that we can clearly see that these industries have grown in the past quarter century, some more than others. “Financial Activities” at top left includes groups like bankers, insurance agents, and real estate agents. While currently at its highest ever, it’s hit that watermark many times in the past decade. 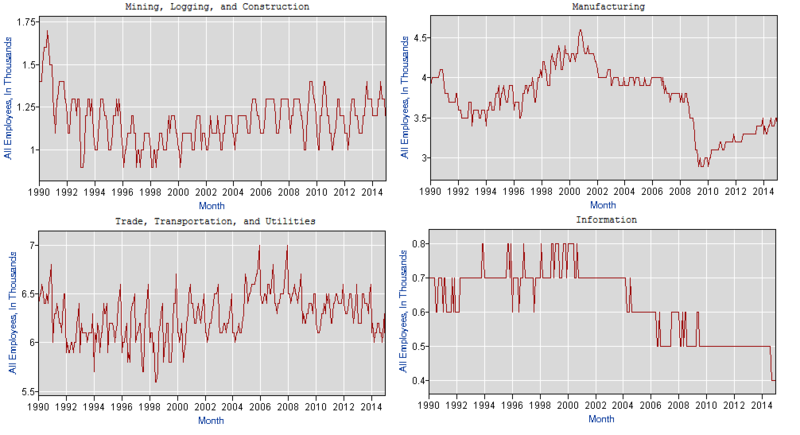 The industries fell by similar amounts during both recessions, but the late 2000s down-period was much shorter. The “Professional and Business Services” sector shown at top right includes engineers, architects, veterinarians, scientists and other technical professionals not associated with academia or government. They definitely saw a substantial drop during the ’90s recession, and it mimics that decade’s lengthy downturn. 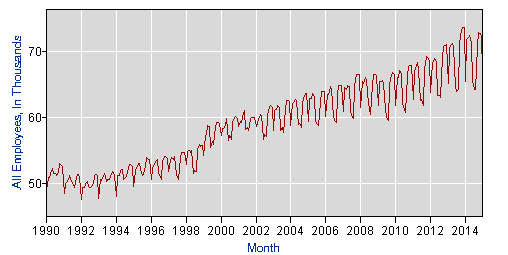 The late 2000s recession is barely noticeable, just like the overall jobs picture. “Leisure and Hospitality” at lower left is easy enough to define – hoteliers, restaurants, and professional entertainers like musicians and artists. 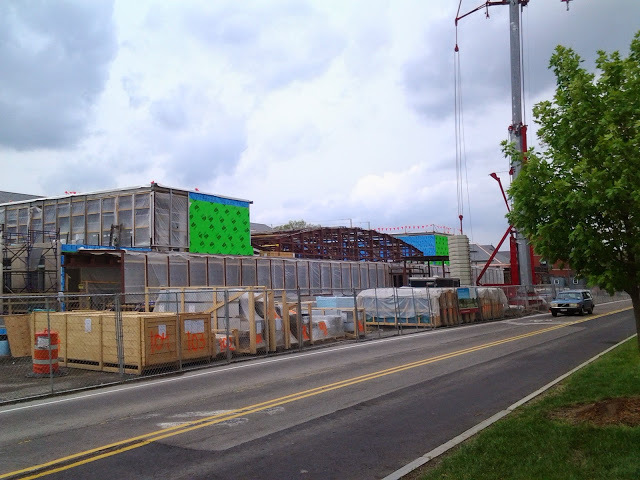 There’s been a big push in the hospitality subsector with new hotels in Ithaca opening recently and in the near future, but the job growth isn’t all too impressive, only a few hundred jobs during peak periods. Once again, this sector was deeply impacted by ’90s recession, and jostled though not seriously damaged by the 2000s recession. The last category, “Other Services” on the lower right, is a catch-all. In this category the BLS includes mechanics, dry cleaners, nannies, social and environmental non-profits, clergy and lobbyists. Given this area’s strong social activism, there’s little reason to wonder why the jobs totals have steadily risen, even during the recessions. These four probably played a role in Ithaca’s growth in the past 25 years – the city and county have transitioned from factory workers and tradesmen to engineers and non-profits. But I still have yet to touch on the two biggest categories, “Government” and “Education and Healthcare.” Those two, plus some ideas on why the 1990s downturn was worse than the late 2000s recession, will be presented in Part III. Ithaca’s economy has been growing in the past 25 years. Like any market, it’s also had its share of ups and downs – in particular, a recession in the early 1990s and a recession in the late 2000s. Nationally, the early 1990s recession was mild, especially in comparison to the Great Recession of the late 2000s. The 1990s recession only lasted 8 months on a national level (July 1990 – March 1991) and GDP loss was -1.4%. The Great Recession was 18 months (Dec 2007 – Jun 2009) and a GDP loss of -4.3%. 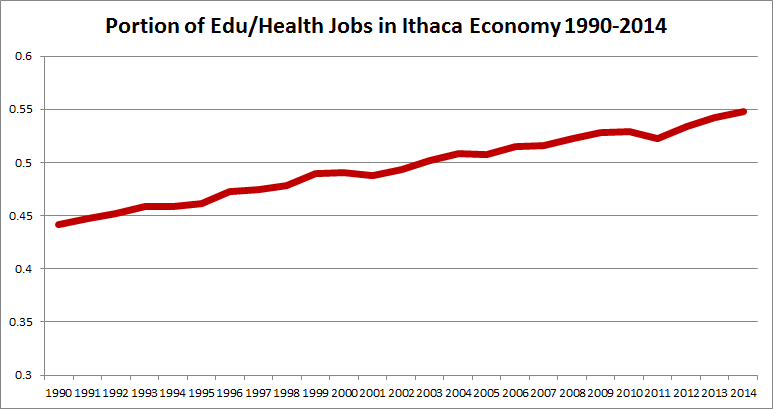 In Ithaca, these recessions played out a little differently. According to the Federal Bureau of Labor Statistics (BLS), after a peak employment of 53,100 non-farm jobs in October 1990, the economy sputtered and shrank, falling as low as 47,700 jobs in January 1992, and not surpassing the 53,100 high mark until October 1995. The first half of the decade saw no real growth in jobs numbers. The Ithaca College Economic Index, which establishes a number based on local economic indices, further highlights the poor 1990s ecnomy. The way the index works is that the index value in January 1985 = 100; 101 means 1% growth since Jan 1985. The county grew at a rapid pace in the late 1980s, and the index was 135.32 in March 1989. But by March 1992, it was 115.75; the economy shrank 14.5%. The index wouldn’t go above 135 again until February 1999. By this measure, Ithaca and Tompkins County had a lost decade. In contrast, the late 2000s recession had a pre-recession peak of 158.66 in January 2008, fell as low as 149.44 in March 2009, and a new all-time high was established in June 2010. The economy index contracted only 5.8% during the recession, and Ithaca recovered relatively quickly compared to many cities. The jobs total is hardly a blip, an averaged loss of 200 jobs in 2009 that were quickly recovered in 2010’s growth. So, why the difference? That’s the $64,000 question. An oft-cited reason is that Tompkins County’s institutions of Higher Education are responsible – Cornell, Ithaca College and TC3 were less buffeted by the economic headwaters that made the recession as bad as it was. 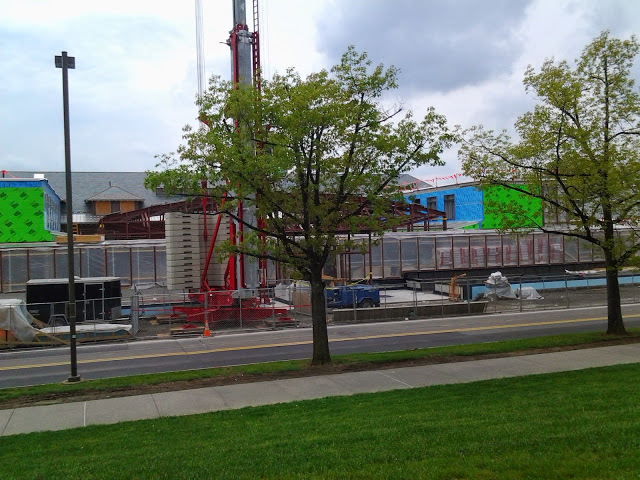 Cornell published a report in the late 2000s saying that its construction projects alone provided over 700 jobs. Visitors to the university and staying in hotels and eating at local restaurants was claimed to have created almost 800 jobs. But the colleges were here in the early 1990s as well. And while Cornell eliminated 900 positions during the recession by retirement or layoffs, the job numbers suggest that other employers must have picked up the slack in employment. One of the ways to try and figure this out would be to look at the breakdown in employment by sector as described by the BLS. Perhaps education didn’t play as much of a role in the 1990s recession, or other industries grew while Cornell’s rank were whittled down in the late 2000s. Part II will be examining the job sector breakdowns and running some calculations to see just what changed in the job totals, and when. 1. Starting off this week’s round-up, here are some new renders of PPM Homes’s apartment project proposed for 215-221 West Spencer Street just south of downtown. Note that C & D are the same design, but mirrored. 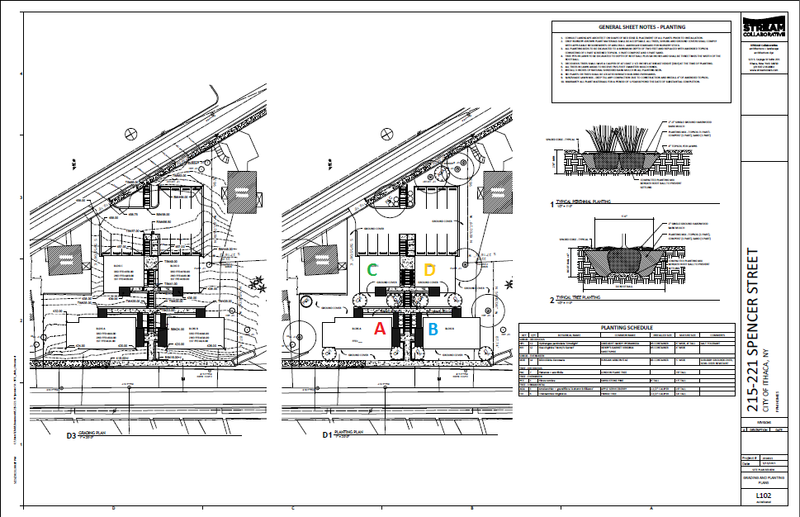 The general forms are pretty much the same as the original sketch plan, but the porch and windows have been altered and the rooflines have been tweaked on A and B to give the Spencer Street facade a little more visual interest. 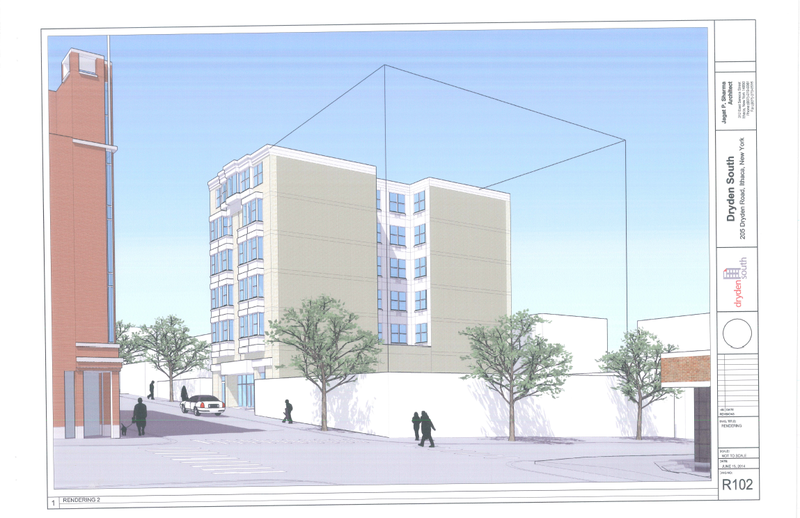 The 12-unit, 4-building project is being described as a “pocket neighborhood”. 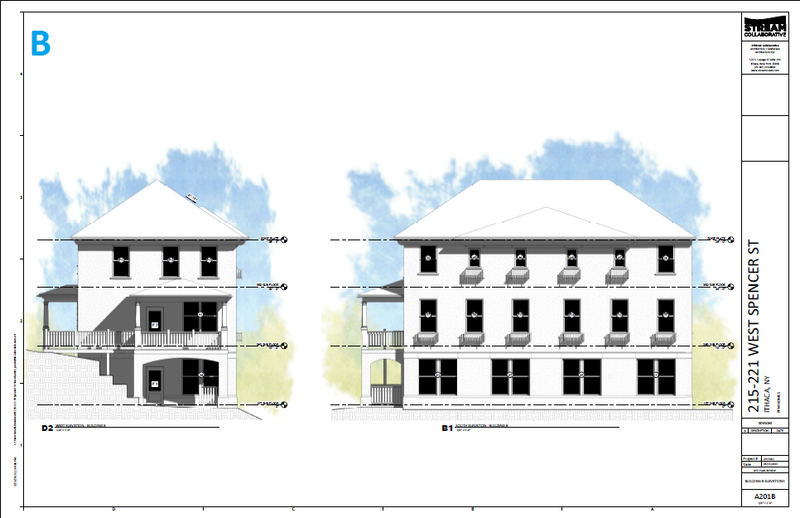 The two upper buildings closest to West Cayuga will have three two-bedroom units here, and the lower buildings facing West Spencer have a combined four two-bedroom units and two three-bedroom units, for a total of 26 bedrooms in the project. 12 parking spaces are provided as required by zoning. The owner is looking into remote net-metering of an off-site solar panel installation to provide all of the project’s electricity needs. The site will launch into the formal planning board review process next month. The steeply-sloped 0.47 acre parcel has been vacant for several years, and currently sees use as an informal 12-space parking lot. The property was originally marketed for affordable housing projects only, but received no purchase bids. Once the affordable stipulation was removed, the parcel was marketed once again, and Ed Cope bought the parcel for $110,000 on March 6th. The building designs are the work of local architect Noah Demarest of STREAM Collaborative. Random aside, I just found out that PPM’s Ed Cope is a Cornell biologist. And here I thought writing this blog and being an air quality scientist was an interesting contrast. 2. There might have been a day in not-too-distant past where someone said, “You know what Ithaca needs? Mini-golf.” Apparently someone heard those wishes. 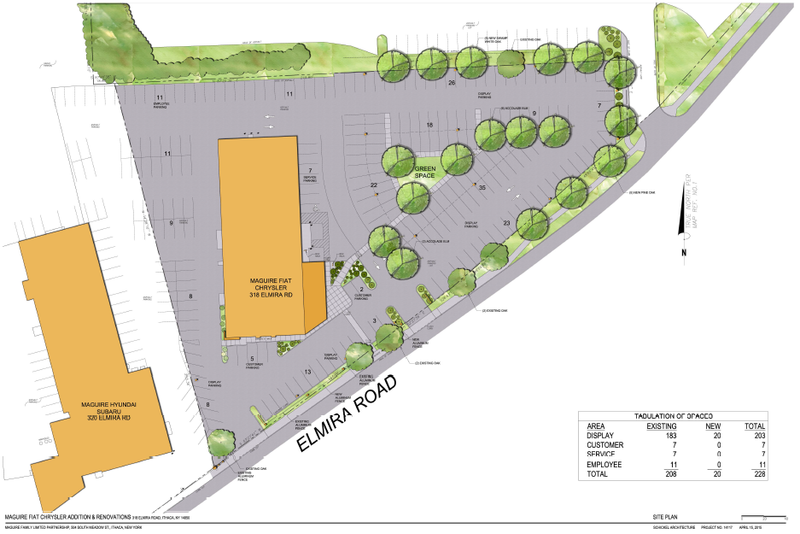 the Town of Ithaca’s Planning Committee will be looking at a possible zoning modification down near the intersection of Elmira Road and Seven Mile Drive that would allow a mini-gold establishment to move forward. Stretching my memory here a bit, I seem to recall a mini-golf place up by Trumansburg, but if my google search is any indication, it closed a couple of years ago. I suppose there’s a niche to be filled. The Inlet Valley Gateway district is intended to be a setting for a mix of office, small-scale retail, hospitality, and tourism and agritourism uses, with low-impact light industrial, artisanal industrial, and skilled trade uses. The scale, architecture and landscaping of future development will need to be carefully designed and articulated. This area should retain a semi-rural character, with deep setbacks from arterial streets, wide spacing between uses, landscaped front yards, and vehicle parking sited on the side and/or rear of structures. Shared curb cuts will reduce potential conflicts with highway traffic. Sidewalks should follow streets, with connections to adjacent areas planned for residential development. 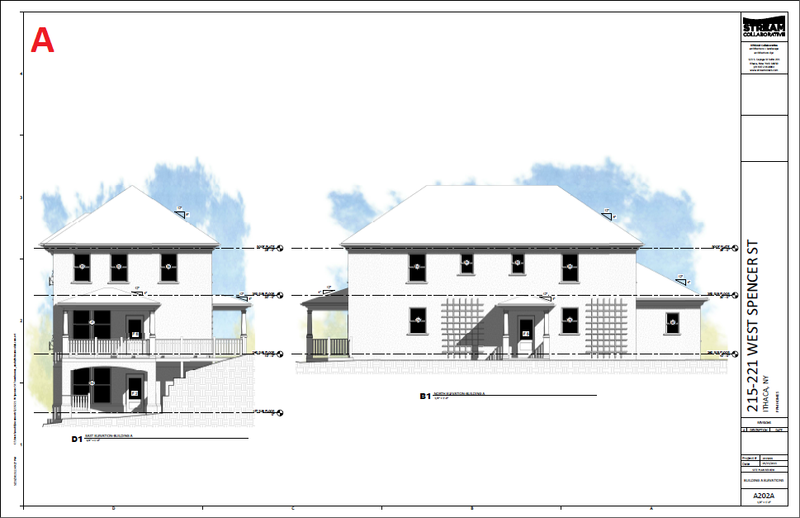 Architectural design, landscaping, and site planning regulations should apply to all uses in this area, including industrial uses. Agglomeration of mechanical commercial uses, and incremental expansion of commercial zoning resulting in strip commercial development, will be strongly discouraged. It sounds like that if the site is designed right, it could be a good fit. Probably a better fit than the Maguire’s dealership/HQ plan that was shelved a few months ago. 3. 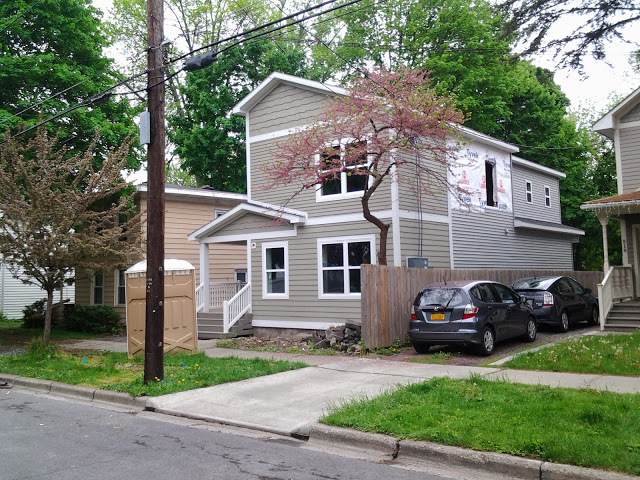 Here’s a couple of photos of the new duplex being built at 514 Linn Street. 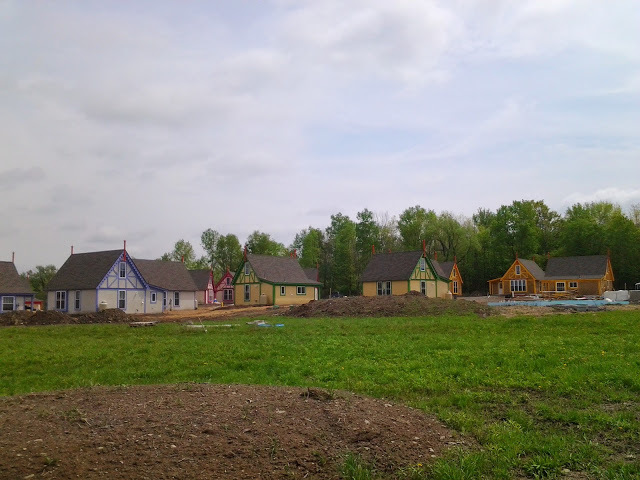 Each unit will be 3 bedrooms, and the apartments will be completed this summer. 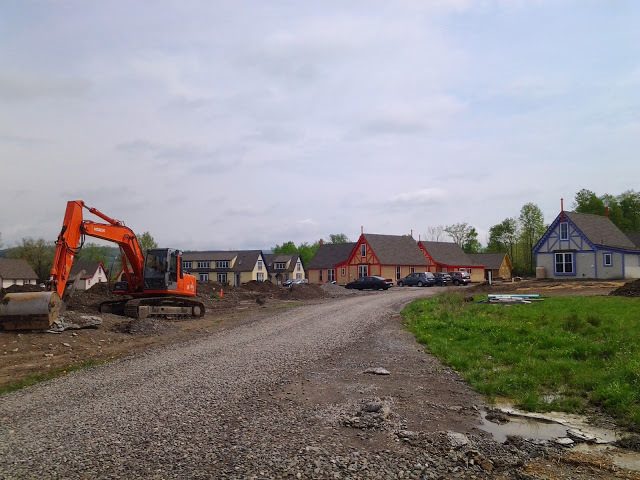 The building is being built on the foundation of the previous home that existed on the site, which dated from the late 1800s and was a near-copy of the peach-colored house next door. 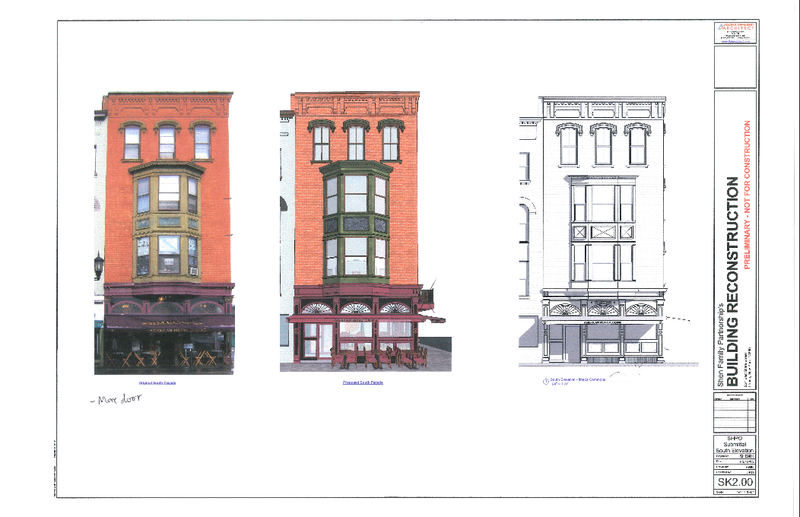 514 Linn is being developed by the Stavropoulos family, who run the State Street Diner. 4. 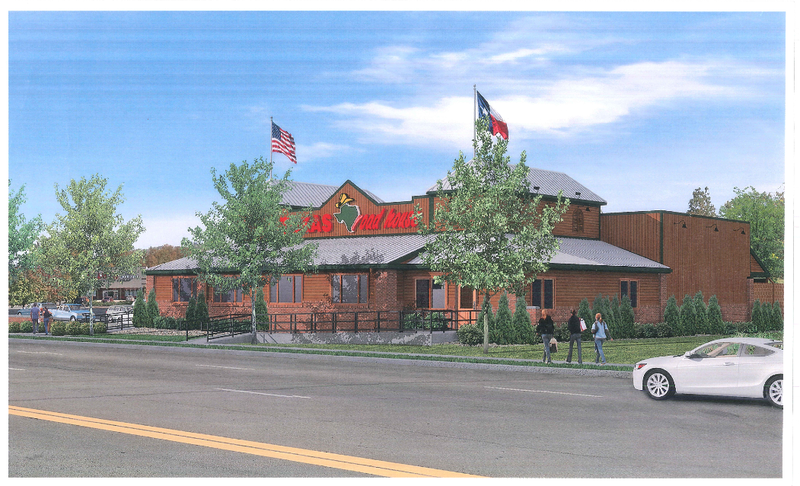 In an effort to win over the city, Texas Roadhouse is tweaking their proposed restaurant off of S. Meadow/13. Latest render here. 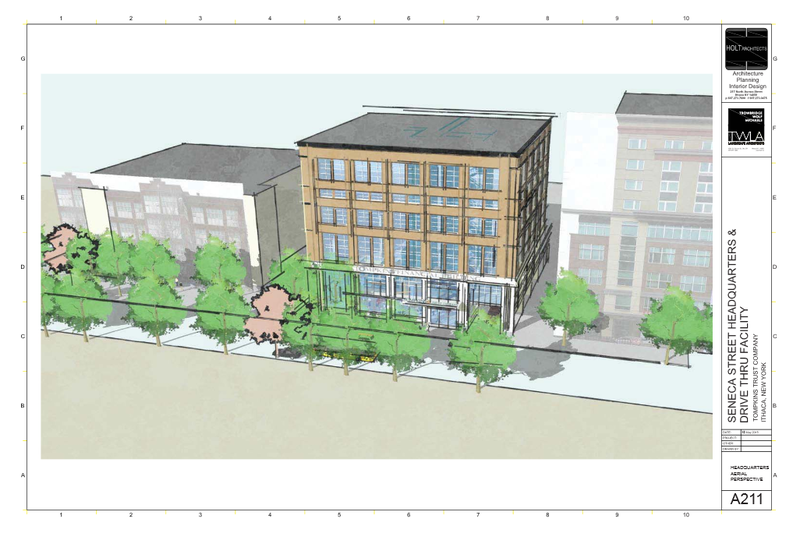 Members of the planning board have previously expressed concerns that the original design had the entrance facing northward into the parking lot rather than the street, and that not enough attention was being placed on the street-facing west side. If the render is any indicator, the modified proposal still has a primary entrance on the north side of the building, but the street-facing side has a handicapped entryway, and the landscaping has been spruced up. Dunno if it’s what the board quite wanted, but they’ll decide if it’s good enough during their meeting next week. 5. 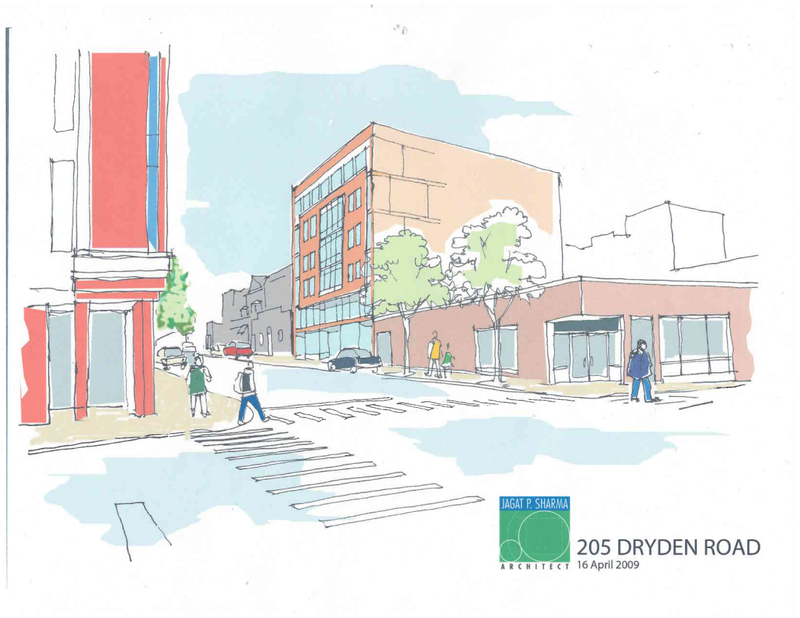 Looks like Pat Kraft’s Dryden South project (205 Dryden) has a website up and running. 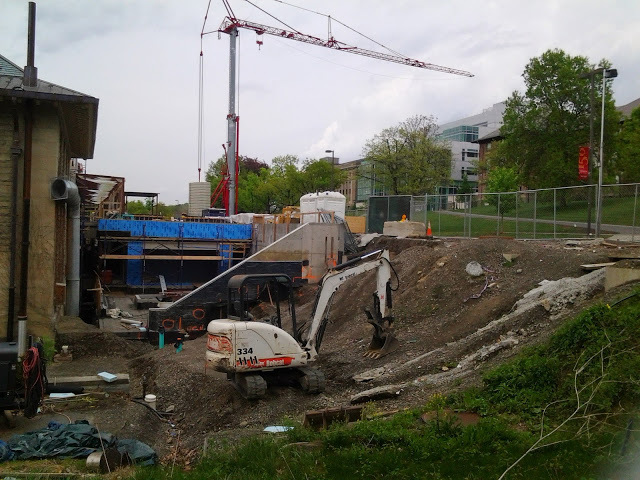 The 10-unit, 40 bedroom project will start site clearing in a few weeks, with excavation/foundation work going through the summer (according to an interview conducted by the Sun, Kraft hopes to have structural steel rising by the time students get back in late August). The 6-story, 65′ building will house Kraftee’s on its first floor, with two units of four bedrooms each on each floor above. 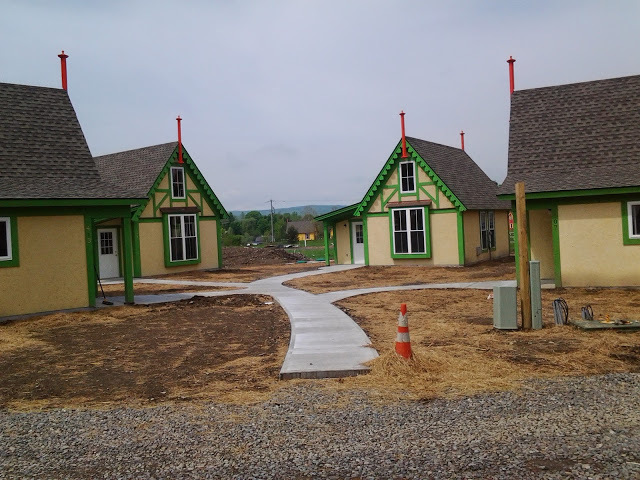 units will be available for rent starting next August. A neat little detail from the site is this old conceptual sketch done by Jagat Sharma for the site. Note the April 2009 date at lower right; this project has been in the planning stages for years, even though it only hit the Planning Board last Spring. On a personal note, I’m glad this hulking box didn’t end up being the final design. 6. 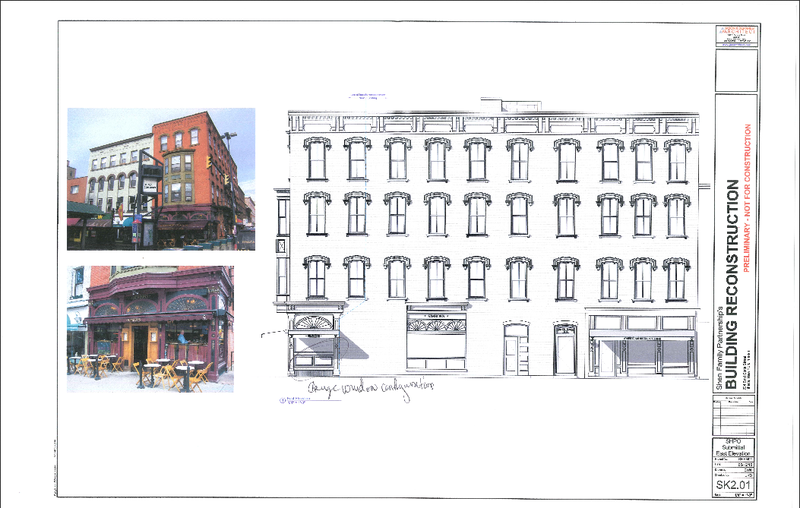 For those interested in what’s going on with Simeon’s, here’s an updated sketch design of the rebuild, courtesy of the Ithaca Landmarks Preservation Council (ILPC). The somewhat controversial side balcony/overhang is gone. About the only major difference between the original entrance and the rebuild is the location of the front door, which is now on the left (west) side instead of being in the center. IA. A minor subdivision to create a new home lot a 212 Hook Place on West Hill. IB. A minor subdivision to divide a property on Hector Street on West Hill. The sisters applying for the subdivision are splitting the land among themselves but intend to keep both lots “Forever Wild”. IIA. 210 Hancock gets its public hearing and possibly its Determination of Environmental Significance (which if okayed means that the project can be considered for prelim approval in June). I’m hearing there might be opposition mobilizing against the project. Given how transparent the whole design process has been, and that this is affordable housing in an urban area that struggles with housing costs, I’m going to be very, very disappointed if this happens. 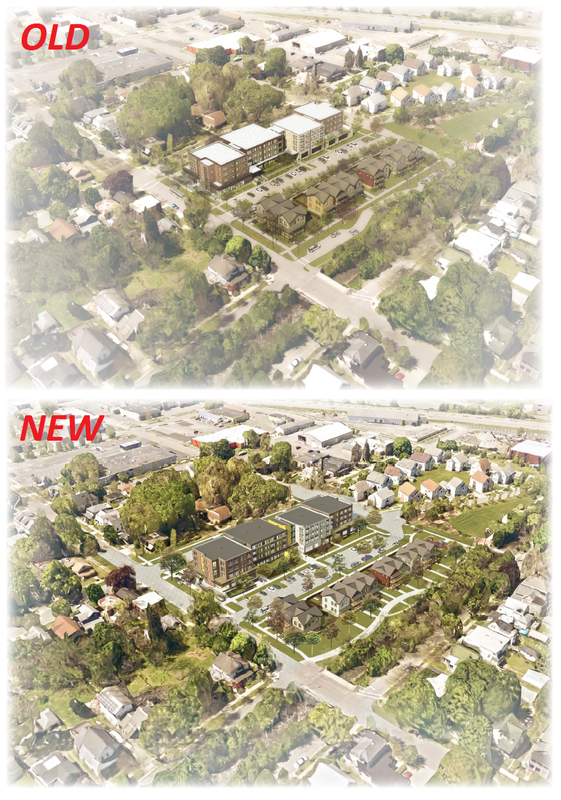 D. Declaration of Lead Agency (Planning Board agrees to conduct review) for the Maguire Fiat addition. The board will also be conducting a review of State Environmental Quality Review (SEQR) forms used in determining environmental significance. 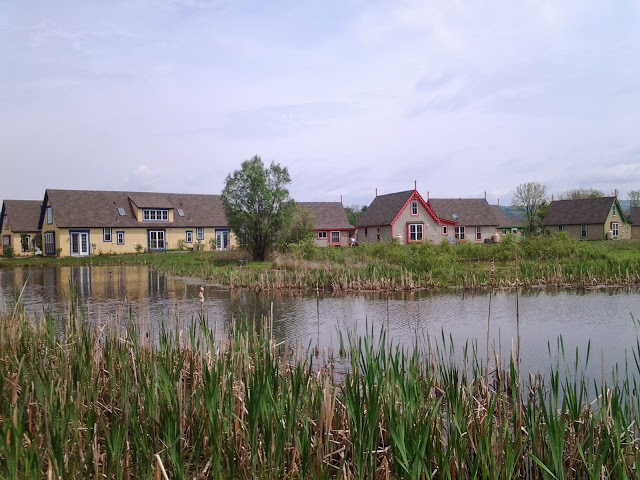 With three months filed away since my last trip out to the Boiceville Cottages, it seems like a good time for an update. The pace of construction has picked up with the onset of the warm half of the year. 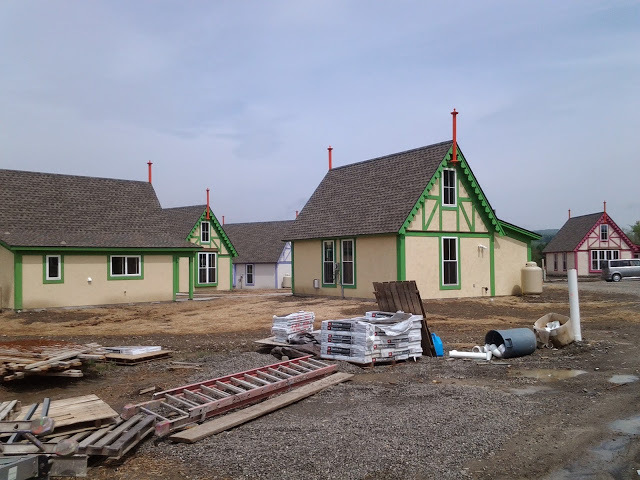 The stucco homes with pea green timber trim have been completed. 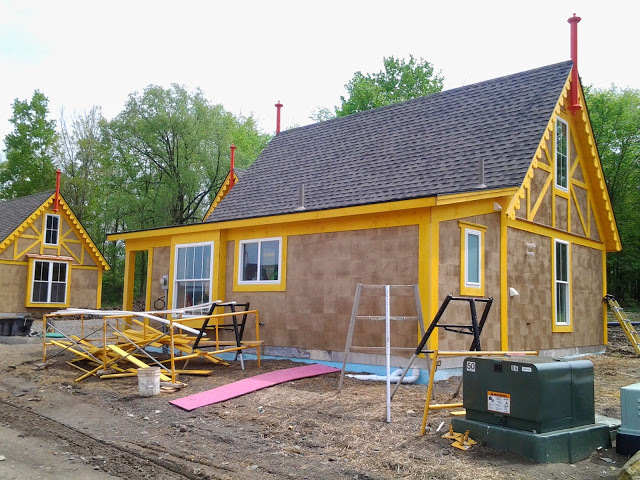 Three homes that were sheathed and had only a few windows fitted in February have progressed have now been fully fitted, stucco has been applied, and an attractive canary yellow timber trim is being attached to the new homes. 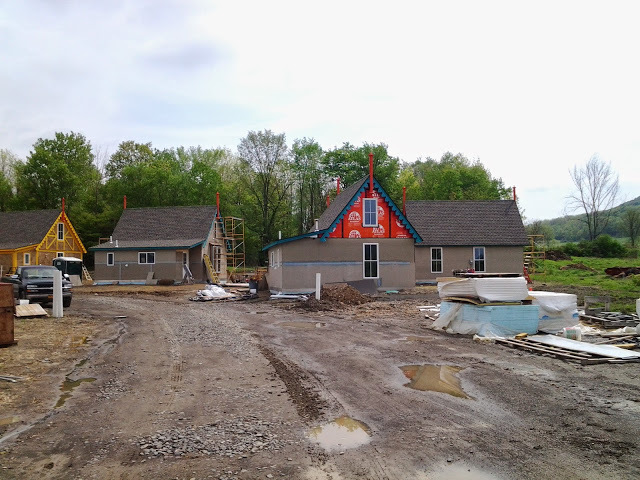 Four more homes (stucco with teal timber trim) have started since last February, and these are not as far along – some of the red waterproof sheathing is still visible while the exterior finishes are being applied. 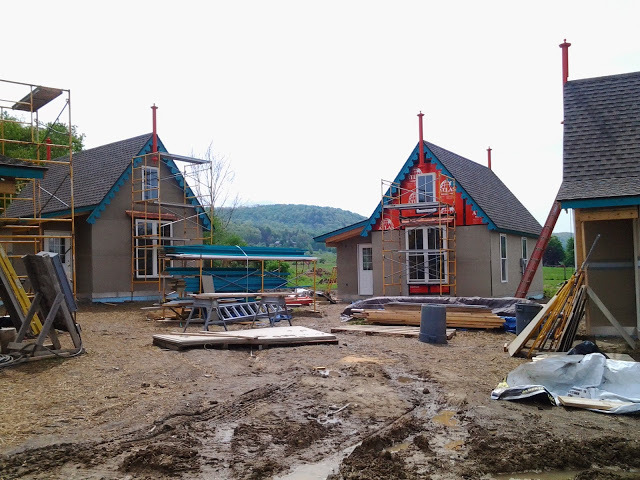 Three concrete slab foundations, outlined with blue waterproofing (the covering might be for cement board being used to protect the slab insulation) are ready for new house construction in the near future. Suffice it to say, given the amount of disturbed land nearby, more slabs and more homes are a likely bet as we press on towards summer. 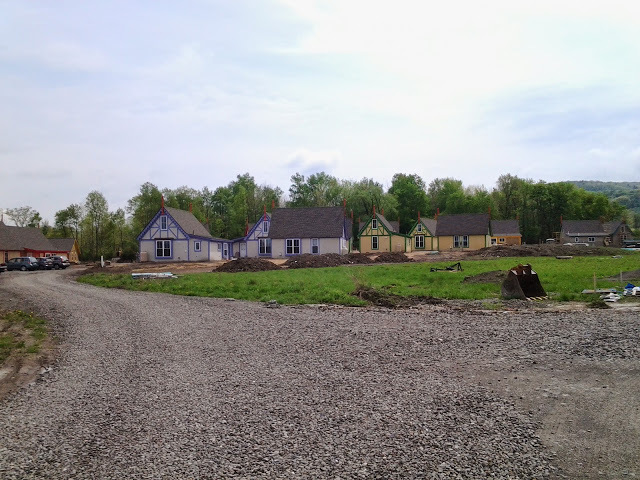 So far, there looks to be at least 17 units completed during this calendar year. 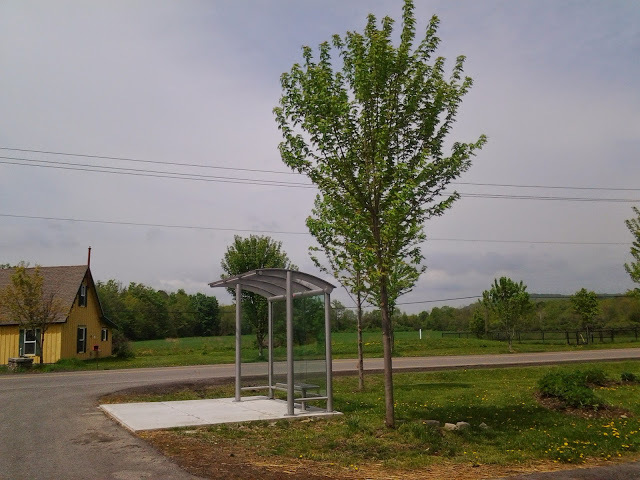 A couple more community features have also been added – a small wooden footbridge now crosses the neck of the pond, and a simple, modern looking bus stop shelter has been built near the meeting house. Boiceville is in the midst of a 75-unit expansion, which will bring the number of units on the property to 135. 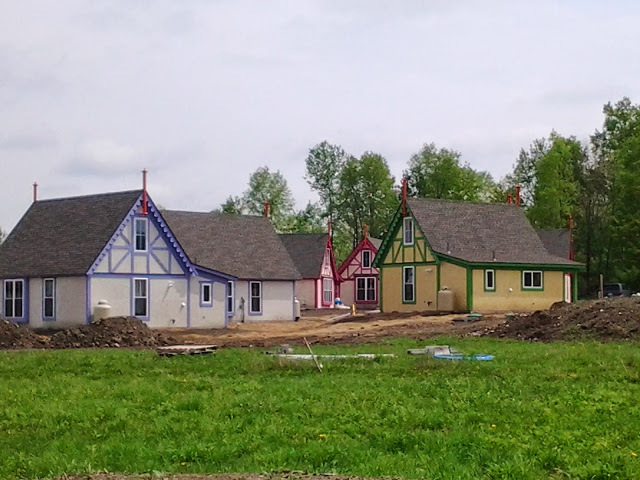 Most of the units are 1 and 2-bedroom cottages, built in clusters of three, although a few “gatehouse” rowhouses offer studios and 3-bedroom units. The initial 24 units were built from 1996-97, with another 36 units built in the late 2000s. Since the last update on Klarman Hall in February, the snow has melted and East Avenue has been reopened to all vehicular traffic. 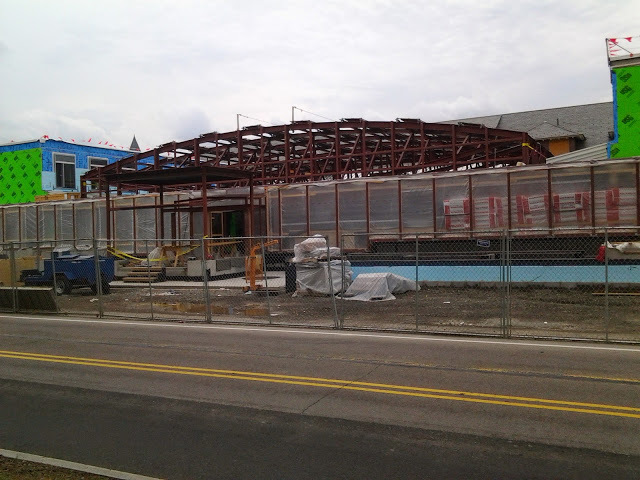 Construction firm Welliver has been pouring concrete on the upper floors and the structural steel has been erected. Concrete pre-cast has been installed on the atrium-facing portions of the top floor, with bright green glass-mat sheathing visible on some of the panels. Within these panels, the window cutouts are visible, and as seen in the last photo, windows have already been installed on the south block facing into what will be the atrium. Windows will be installed in the north block shortly. To hoist these panels into place, a telescopic crane is used. 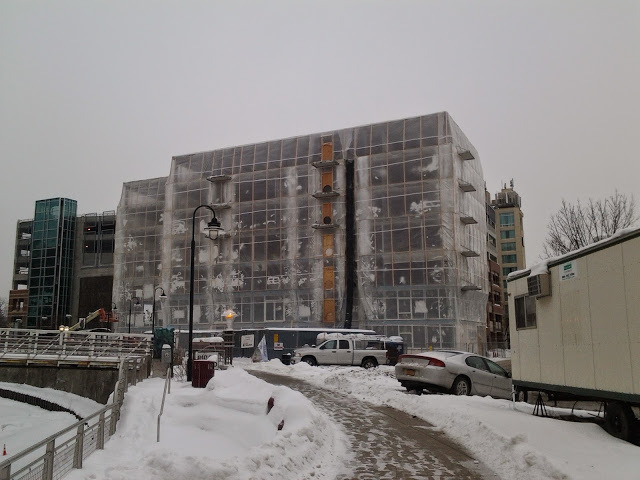 Less visible to the outside observer, interior wall framing is underway on the upper levels, with utilities rough-in continuing, and some drywall installation underway in the more complete areas. Openings have been created in Goldwin Smith’s rotunda (where people will flow in and out of Klarman’s atrium), and the sub-slab (the concrete below the new floor) is being poured. The long-term construction schedule calls for window glazing (exterior glass wall installation) and drywall to be complete by the end of June. The atrium skylight glazing will take place during the summer, the elevator will be installed by August, and the green roof will be prepared just as the fall semester kicks in. 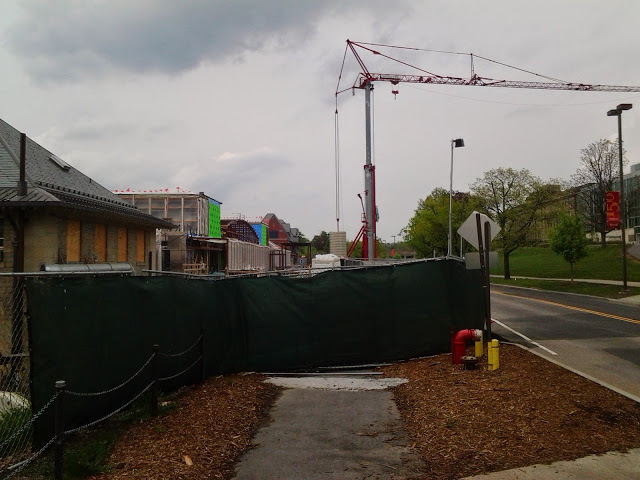 Klarman Hall will open its doors to the public in December if all goes to schedule. The 33,250 sq ft building was designed by Koetter | Kim & Associates, and is named for billionaire hedge fund manager Seth Klarman ’79. The cost of the new building, which began construction in May 2013, is estimated at $61 million.